blocks and I am currently sewing the blocks together. 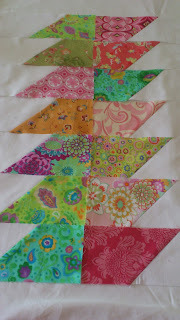 I decided on two different versions..
And this one for a quilt... can't wait to get it finished. Hopefully I can this long weekend in South Aus....X X fingers crossed! be totally inspired by all you can make with the amazing dies available. But please only one comment per person. announce the winner on the 11th. like patterns, dies and give-away's too. I like your table runner idea. I'd love to have the GO Birds, the Calico Cat, and the Ribbon Twist. Very cute table runner. I'd love to have a cuttle little GO! Baby and the three dies I'd select would be for the GO! Sparkle set, by Sarah Vedeler (e.g. Christmas Tree, Diamonds, Snowflakes, etc) as I want to do a machine embroidery project for a charity fundraiser with those designs. Your runner is going to be beautiful! I would love to win the Rose of Sharon, Drunkard's Path and Holiday Medley. Thanks for the great giveaway! Great the way you can use the some pattern in two different ways by just turning the pieces. Love them both. I'd love to get the Funky Flowers, Tumbler, and 2.5" strip cutter. This looks like sooo much fun!! Oh I would love to win a baby go!! I would like the small rag die, the small tumbler die and the round flower die! Thanks so much for the chance! Your Go projects are lovely! I would choose the Go round flower, the hearts and the circle dies. Thanks so much for the chance!!! Difficult decision! I think the dove, rag squares and tumbler would be fun! Oh I know which ones I would want! The bat and cat die, the pumpkins die (can you tell I am getting that fall feeling) and the cancer ribbon die. I am currently helping my daughters boyfriend with his Eagle Scout project, he is making quilts for our local cancer center. That die would be perfect for some of his quilts! Thank you for the chance to win. I would take the alphabet die, the number die and the 3.5" triangle. I hope you enjoy your GO! Dawn, I would just love to own a 'Go Baby' and the three dies I would choose would be the 3 1/2" Drunkards Path, the 6 1/4" Apple core and the 6 1/2" Tumbler. What fantastic scrappy quilts they would make. thanks for the chance to be in the draw. Oh my goodness Dawn, what a fantastic giveaway!! I would love an Go-Baby and would get the Ric - Rack, the 3.5 tumbler and the Go Dove! Yep, that would suit me just fine!! Your table runner and quilt top look gorgeous!! such beautiful fabrics! Dawn ~ I REALLY love what you've done so far. I can't wait to see the end results. I keep drooling over the wonderful dies available on the Accuquilt site and can't decide which I'd start with. I go back and forth between what I might use all the time and those that are more 'fun' but maybe not used as often. So hard to decide. I would love the Rob Peter to Pay Paul, the Circle dies 2,3,5", and the Dresden. Imagine the wonderful delights that would come from those dies. The head is spinning with ideas already. Oh I so want to play with one of these! And I LOVE what you have done with the chisels! You've convinced me that those should be one of my 3! So I would pick the birds, the 2.5" strips and the chisels! Thanks for the opportunity to win one of these, they look amazing. You have had heaps of fun with it. oooo... if I was lucky enough to win, I would love the 2" square, the 4x4 diamond and the fall medley. Thanks for the chance to win! ohhh! Heart Die, Cicle Die, Apple Core...I keep putting those in my cart but not being able to buy....thanks for the great giveaway! Never seen it in real life. Would love to cut my own charms the easy way. So 5" squares I would choose. And to play some more the 3,5" squares with the 3" half squares. With kind regards, Ingrid Mulder, the Netherlands. You are so lucky Dawn to be able to play with the Go Baby. There are so many dies to choose from but I think I would choose the tumbler (3 1/2"), the double wedding ring and finally the circles (2", 3" and 5"), thanks for the chance to win a Go Baby. I love the accuquilt came out with an alphabet die set. I also like the circle and the holiday sets. The chisel die blocks look fantastic Dawn, gorgeous fabric....wow, how good would it be to win the Go Baby....I have my fingers crossed...the drunkards path and the tumbler look fantastic... lots of choices...thanks so much Dawn..
Love your table runner. Now if I was the lucky winner I would probably choose the Tumbler,Critters and Bountiful Baskets. Thanks for the chance to enter. Thanks for the chance to win a Baby Go cutter. I'd like the apple core, hexagon & tumbler. Thanks for such a great giveaway. I have always wanted to do a Sunbonnet Sue quilt to replace the one my mother did for me when I was born. After more than 56 yrs it has been loved to death. The top is almost stitches only now. The Baby Go would put this at the top of my to do list. No cutting all those small pieces by hand.So if I win please send me Sunbonnet Sue, Overall Sam & rose of Sharon. Thanks again. Pretty fabrics you've been playing with. I love the idea of having something to save time so basic shapes would be my choice. Ones like the 6 1/2 inch triangle,Quarter Square 4" finished and your chisel look great. Thanks for the opportunity. How lovely Dawn - they're going to be beautiful! And a give-away too? Wow....at first I didn't think I'd need one of these, but the more I look at them I really think they'd be wonderful! I'd have to get rectangles, squares and half-square triangles - I hate cutting them, I always get them wonky!!! But they're the ones I use the most, imagine how much easier life would be! Not to mention FASTER. Thanks for the chance to win! I'd love to win a go. I'd pick the strip die, the winter medely and probably the wedding ring. Thanks for chance to win. I think I'd like a hexagon, a circle and maybe the half square triangles. Wow, how cool!! I would love to win one of these. I would like the Hexagon, Tumbler and Apple Core. I am glad that you have had fun with yours! Thank you for the chance to win one of these fantastic time savers. The three dies I would like are the Go Birds, The Rose of Sharon and the Ribbon Twist. Too many dies to choose from....but if I could have three wishes I'd wish for the go birds,go funky flowers and go hexagon 2",3",5" dies.Here's wishing my number comes up :) Barb. Thanks for the opportunity to win. I'd choose Alpha Baby, Critters and Birds. Thankyou for the chance to win. I would like hexigons, go birds, funky flowers. fingers crossed. What a fun give away you are able to do Dawn! I would choose the circle 2"-3"-5", ribbon twist, and feathers! Wow, this is great. I love the circles, snowmen clothes and reindeer dies. Sounds like Christmas to me! Thanks for the great opportunity! Would I ever use one of these? Certainly if I won one. What a fantastic giveaway and I think I'd go for the hexagon, circles ( can we ever get them perfectly round?? ) and sparkle diamond dies. Think I've worn my lucky rabbit's foot out though! What a cute tablerunner. I'll have to give your pattern a try. I was on Accuquilt's FB page and saw your comment about your giveaway. If I was lucky and won I'd love to have the drunkard's path, tumbler and the 2" hexagon dies. If I was lucky enough to win one of those, I would chose Go Hexagon 2",3",5", Go Calico cat, and Go carefree alphabet. WHOW what a give away! Lets have fun with all these posibillities.. I would like Go flouwer power die set, go holliday medley and sleigh and snowflakes for a hole year of applique fun! I would have to go for Drunkards Path, Hexagons, and Critters. I would love to have a 2.5 inch strip cutter (stash busting!) and Alex Anderson or Sharon Pedersons dies... thanks for the giveaway!! I am loving the fabrics you've chosen in each of your items!! Especially the half hexagons!! And those layouts for the quilt and table runner are perfect!! I think if I got the chance to own one of these little "Baby's" I would use the Tumber 3.5", Chisels (yes, looking at yours is inspiration enough! ), and the apple core. Thanks for the chance to win one!! Love the chisel quilt. Very fresh looking! So Spring and just my style! I would choose the 2 and a half inch strip cutter (2 strips)for cutting my own jelly rolls, the Hexagons 2" 3" & 5" for English paper piecing and the Tumbler 3 and a half inch to use up all those scraps!! Ahhh...the quilts I could make! I would choose the circles, hexagons,and the 2.5 inch strip cutter : ). Your table runner is so cute, I guess I would need to get the chisel too! I would get the tumblers, the hexagons and probably the circles. I don't mind what dies I get! I would love to have a GO Baby, please pick me! (don't think anyone else want it as much as me, do you?). If I'm the lucky winner I would like to have The Fun Flower, the 2 1/2 inch strip cutter (2 strips set) and the heart 2", 3" and 4". What a lovely runner! I was thinking the other day (as I was cutting for a quilt with my poor old rotary blade since my good one was on loan) how much easier life would be with a Go! I think I would choose the airplanes to make a quilt for Mr5, a 3.5" square, and the Rose of Sharon by Sharon Pederson! Cool runner! I really like the 2" squares, circles, and hexagons dies. Hi Dawn, thanks for sharing, I would love to win a Go Baby with 2.5 inch strip, 3.5 inch tumbler and bountiful basket dies. Your chisels look great, cannot wait to see how you quilt them up ... hope your getting lots done on the long weekend, cheers Sue SA. If I were to win (and I hope I do) I would probably choose a hexagon, one of the Christmas dies and a rose of sharon. my three die choices; circles, drunkards path and the tumbler. Oh, Dawn, what a fabulous giveaway. Thanks so much for the opportunity. I would love the Hexagon, Ribbon Twist, and Rose of Sharon dies. Thanks for your lovely giveaway. Oneday hope to win one, but have given DH birthday and xmas hints. 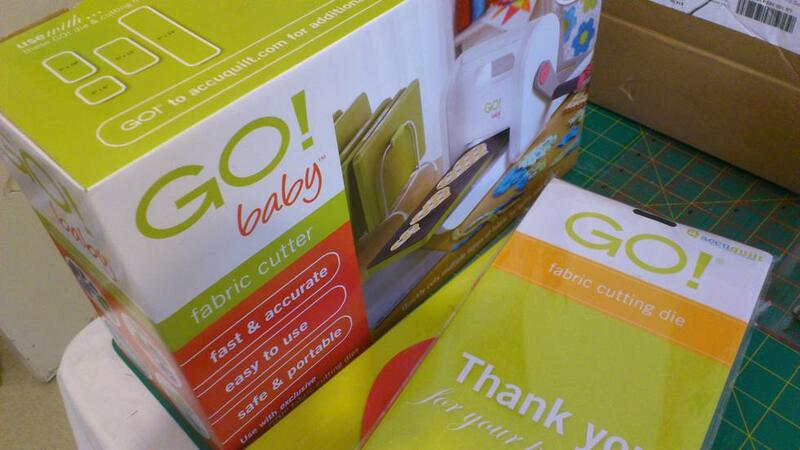 Hi Dawn, Thankyou SO much to Accuquilt and to YOU for the chance to win a Go Baby! 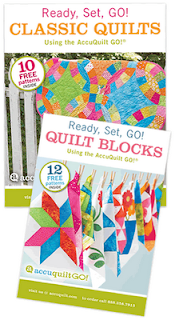 I already "like" Accuquilt on Facebook. If I could choose 3 dies, I would like the Go Critters, Go Rag Square 5 1/4" (your hand gets so sore doing all that cutting on raggy quilts!) and the Go Strip Cutter 2 1/2" - so thankyou again for the chance to win such a wonderful prize! Oh to make the cutting out of quilts easier!! A girl can dream can't she? What a generous giveaway, how to choose if I am lucky enough, Go heart, Go 5" square and Go Birds would be my choice in dies. Thankyou Dawn. I would love one of these little 'babies'! Loving the Daisy, Hearts and Funky Flower dies! Thanks for the opportunity. These Go Cutters are quite amazing. I like many others would love to win, but I know we all can't. I like the Rose of Sharon, Bird and Feather dies. Would have to go with a hexi die, the apple core die and the little birds one. So very inspiring. Just think of all the things I could get done if cutting the fabric was fun instead of daunting. Oh this is great and I really, really want to win!!!! If I do I would choose Hexagons, Double Wedding Ring and Hearts. Thanks Dawn for this chance. I'd love to win a Go! Baby! I'd pick the chisel, Rose of Sharon, and alphabet. I'd choose circles, feathers and drunkards path! I'd love to try the 2" multiple squares, the rectangle and the drunkard's path dies. Thanks for the chance! Well my goodness, who has been having fun with their Go Baby????? I'd love one and so with all my winning wishing...I send you this comment. Love what you made with the dies! My favorites are the funky flower, the Rose of Sharon, and the birds! Wow...I got behind in checking out my favorite blogs, and almost missed this chance to win a Go! Baby!!! I think I'd choose the Rose of Sharon, Tumbler, and Hexagon dies. Thanks! Oh my gosh Dawn, I can't believe you are giving away one of these. I have drooled over these forever. I tell you what, PLEASE enter me in the giveaway and as for the three dies, I want each and every one to make the fabulous holiday quilt shown with the Christmas trees, reindeer, etc., right along with the posting. I LOVE that quilt so much. I'm really excited now just seeing it and am going to try to find the pattern, or just look at the picture and make my own. But, oh boy, to cut all those out . . . I hope I could finish it by Christmas 2012!!!!! So please enter me in your contest, and as always, love seeing the pictures of your wonderful projects!!! Thanks for the chance. I really think the 3.5" tumbler, 2 1/2" strip, and Triangles in Square-3" Finished would be fun to have. I hope I will be lucky and win if not maybe I can get one for Xmas. I would choose..Circles.Birds & Tum blers..
Wow! This Go Baby does it all! I would love the chance of winning one! If I did win, I would love to have: Sunbonnet Sue, Fall Medley, and the Hexagon. I have to fix an heirloom quilt that is a Sun Bonnet Sue and this would save me so much time! Fingers crossed! Thanks for the chance to enter this wonderful giveaway along with the other! I would choose fall medley, half square 4", and stars 2, 3, 4". Thanks for the giveaway! It sure is hard to choose just 3! LOL I think I would like the Critters, The 2",3",4" Hearts, and the Half Square 2" Triangle Multiples. Hi Dawn, thanks for the giveaway! I would be very happy with one of these: Classic Dresden Plates, Winding Ways or Double Wedding Rings. I long for a Go baby! One day, maybe. It's hard to choose 3 dies. I think i'd choose the 2.5" strip, Drunkard's Path, and Hexagons. Fingers crossed! very favorite quilt design Sunbonnet Sue. I hope you enjoy your Go Baby! Wow, what a great gift this would be. I have been tinkering with the idea of the Go Baby and even subscribed to the site a few weeks ago. It is on my wish list. I would love to start with the designer, strip and rag dies. Thanks. Oh my goodness, I can't believe I hadn't entered! I have been so dying to win for two years now! I sew hope this is it! Hi really liked your pattern, the table runner is so cute. What a great idea :) Beautiful pattern. On my Go!Baby wish list is the Flower Power Set and any of the Birds. Although the squares or rectangles would be a delight to have as well! 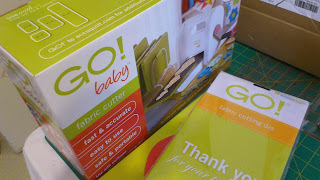 WOW... Its simply amazing how quickly you are able to cut out your creative projects using Go Baby! On my Go Baby wish list would be Flower Power Set, Alphabet set. What an awesome gift/prize. My kids would love the tablerunner. Thanks for participating, Dawn! I would want the die with the three circles, the die with the three hexagons, and the strip cutter. The Go Baby makes it look so easy to cut out those hexagons. I might even be tempted to try some. I would pick the fall medley, the 3 1/2 inch tumber and the hexagons. I'd love the Hexagon 2" 3" 5"
thanks for the chance, Debs. I would choose the Dresden die, Rob Peter to Pay Paul and 2.5 inch strip cutter. Thanks so much. Since I am just getting into applique I would love a Baby GO! Oh, but which dies... I just don't know forsure but I will keep thinking on it. Winning one would be great. The hard part would be choosing just 3 dies. Hexagon would be invaluable, letters would have so many uses, circles would be ideal for yo yos, flowers would be great to add applique to a little girls quilt, well you get the idea. I have tried to win one of these SOOOOO many times. And my die list always changes! 4" hexies, drunkard's path, and an alphabet would be fab! I would definitely pick the dresden die plate. It's my favorite at the moment. Crossing my fingers to win! I would love to wint he GO Baby and 3 wonderful dies, half square 4" triangles, quarter square 4" triangles and the diamonds. Srill reading all the "Why I chose this name" links and having a ball! thanks for the chance to win. I need to get my hands on a Go! Baby, there's just so many great dies!! I would chose the Drunkard's Path, Tumbler and Applecore! Looks like you have your Baby Go working well. The runner and quilt are beautiful. I love your site! That is a great runner you are making. I do not have a GO! but so many of my friends and do and love the machine, I would so love to win one! The tumbler, hexie and triangle dies would be great! i follow accuquilt on fb and have made several of the patterns ... by hand. i would really like to win a go!baby; thanx for the opportunity to do so. I would choose the apple core, the hexagons and one of the holiday medleys...not sure which one! I love your quilt. I keep changing my mind about which dies I would like. I think circles, hexies and drunkards path. I like the 5" square, Go Funky Flower, and the Round Flower. Thank you so much for the chance! Great giveaway! I would choose the cat/bat, the airplane and the 1.5" strip. Thanks for the chance! The Go Baby looks like it would be a great tool to work with! I know I'd want the hexagon, but if I won I'd need a little time to decide on the other two. This is serious business- ha! Thanks for the chance to win. I would love to have a Go! Baby. I want the 2 1/2 inch strip cutter, the hearts and the fun flower if I'm the lucky winner. I love your table runner! Especially the birght fabrics! I am always looking for those but somehow never come across such lovely! I love the GO! Baby! How great to be able to win! I would love the dies Circles. Ovals and Tumblers 3 1/2". Thanks for hosting this give away! I want a GO! Baby! I'd pick the rose of sharon, chisel, and birds, maybe. Thanks so much for hosting this giveaway! 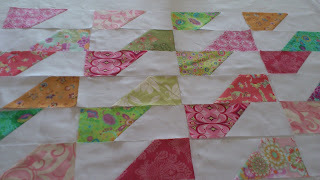 I love the tumbler die, the apple core and the rag quilt die. Many thanks! I know I have a snowball's chance of winning - but a girl can dream, right? If I were lucky enough to win - I'd like the alphabet die - the numbers die - and the feathers die. Thank you to you and to Accuquilt for having the giveaway!! I'd love to win one of these things! I'd love the tumbler, the hexagons and the drunkards path. fingers crossed...........now! My wife would love a Baby Go! She'd pick out the dies, but I think she'd pick applique dies. I'd choose the birds, Rose of Sharon, and tumblers. Although your pretty tablerunner makes me want a chisel as well ;-).